Two of us had flown from Austin to San Francisco the day before, where our best friend picked us up in a Google-rented Chevy Impala. Three girls reunited, we drove for hours that passed like seconds, stopping for oysters and champagne in a tiny restaurant that floated off a dock in the middle of the Monterrey Bay. After lunch I hung my body over the edge of the pier, looking straight to the bottom of the sea. The sun was warm, so we peeled off our jackets and screamed that we couldn’t believe we were here. What a California day, with children running like the sandpipers on the beach. Back in the car we climbed and then spent the night in Carmel, drinking too much wine and poorly made cocktails at hotel bars. We woke up with slight headaches and parched throats, but packed up our car and drove further south along the coastline. Golden cliffs jutted out of the vast, merciless green sea. We watched pods of whales spray water like fountains and the walloping waves crash against purple sand and blue sky. We entered Pfeiffer State Park eager to hike. We’d spent the last hour with our heads floating like balloons out of the windows of our rented car, barely connected to our bodies by the thin grip of our necks. So much unattainable water made our throats dry. It seemed like magic that such tall, thick forests could live right up to the sea. We stopped to hike along side streams that could only be crossed by beams made from fallen trees. We climbed inside hundred-year-old redwoods, blushing at how happy we were in this moment, but also sad that it was a trip that would inevitably end and we’d have to sort out the bills and memories soon enough. Once back in the car, we agreed we needed to buy some bottled water. “Look, isn’t that the place your friend told you about?” one of us pointed. We saw a sign made of planks of wood with the words Henry Miller Memorial Library written in yellow paint and covered in golden lights. We turned down a gravel road that led to a tiny cabin in the woods, with smoke swirling from its chimney and a homemade-looking amphitheater out front. A picnic table near the entrance offered complimentary water and tea, though the water pitcher was empty. We wandered in, hoping to find something to drink inside. We collectively gasped as we entered the most beautiful and magical little bookshop any of us had ever seen. Books hung from the ceiling by strands of white string, and the entire room was made of a shiny, honey-colored wood. There were colorful posters and independent books for sale, new and old, local and international. A typewriter sat next to a Mac computer and t-shirts quoted Henry Miller saying "it was here in Big Sur that I first learned to say ‘Amen.’'" The young man with unkempt black hair working the counter was on the phone with his insurance company, rolling his eyes at the conversation but smiling at all of us. He covered the phone with his hand and invited us to see his friend’s blue grass band at the Fernwood. The little cabin used to belong to painter Emil White, one of Henry Miller’s closest friends. When Emil died eight years after Henry in 1989, he asked that his house be turned into a nonprofit dedicated to Henry Miller and literature. Somewhat ironic, as Henry Miller didn’t believe in memorials. 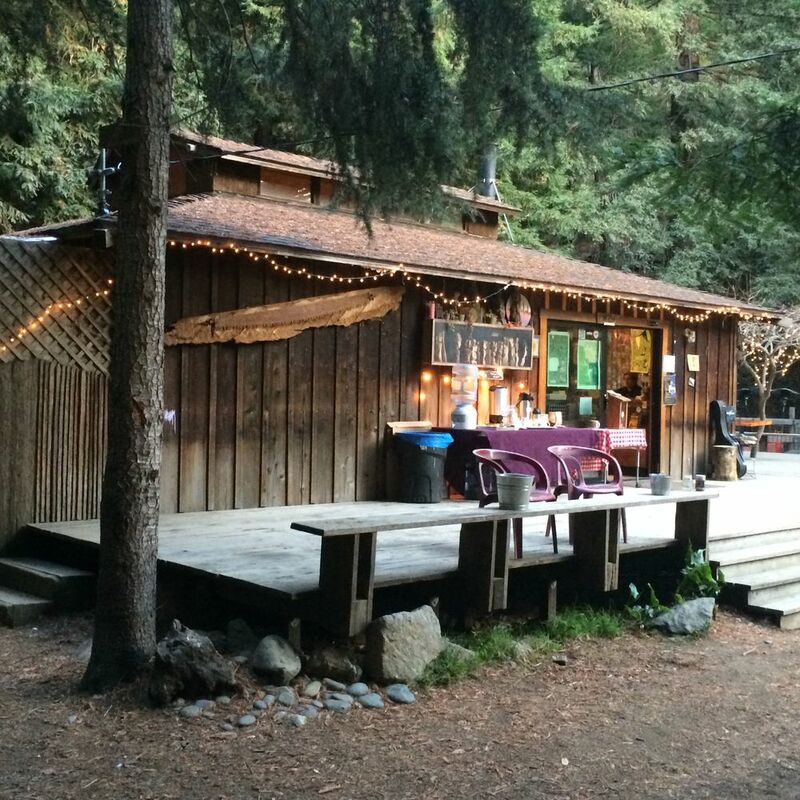 The Henry Miller Library is a public beneﬁt, non-proﬁt 501(c)3 organization championing the literary, artistic and cultural contributions of the late writer, artist, and Big Sur resident Henry Miller. The Library also serves as a cultural resource center, functioning as a public gallery/performance/workshop space for artists, writers, musicians and students. In addition, the Library supports education in the arts and the local environment. Finally, the Library serves as a social center for the community. How funny, because so much does happen here. In the summer, writing workshops are offered and concerts occur frequently that have included performers such as: Arcade Fire, Band of Horses, Fleet Foxes, and more. A gem of a place and the highlight of our trip, The Henry Miller Memorial Library is an enchanting store busting at its corners with history and artistic merit. Its whimsical and esoteric nature exemplifies the heart of Big Sur. Though we still had to stop for water, we left feeling like a need was met, and perhaps a need we had not even yet realized until fulfilled. We drove away clutching new books to our chest, excited for the stories to come.